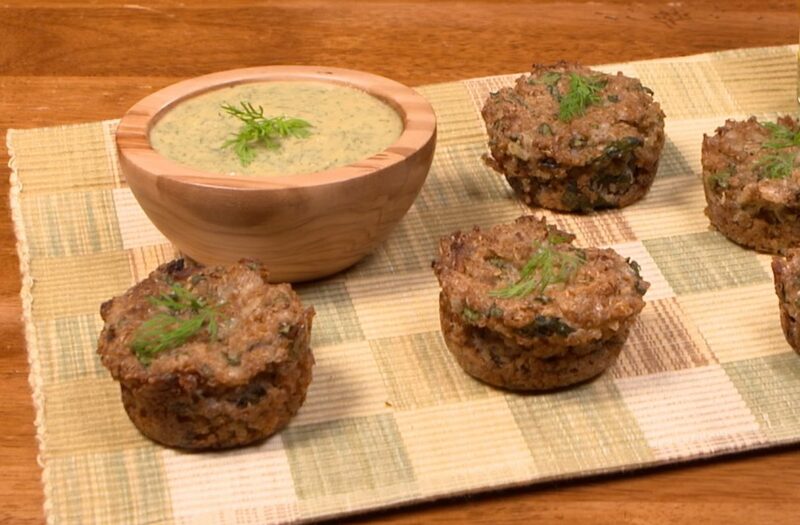 Get the recipe for Quinoa Spinach Bites with Dill Dipping Sauce here! Quinoa is gluten-free and though often called an ‘Ancient Grain,’ quinoa is actually a seed closely related to spinach, chard and beets. Like soy, quinoa is an abundant source of complete protein, which means that it contains all nine essential amino acids. This versatile grain is also high in calcium and iron and a good source of phosphorous, vitamin E and several of the B vitamins. Unlike wheat or other grains that have the germ at the core of the grain, quinoa seeds are encircled by the germ that pulls away slightly when cooked. This quinoa germ forms a delicate ring around the perimeter that adds a slight crunch. Before cooking, quinoa must be rinsed thoroughly in a fine wire mesh colander. This removes saponin, a bitter, resin-like substance that is a natural insect repellent. Quinoa Spinach Bites with Dill Dipping Sauce is a terrific, make ahead appetizer that reheats well and is sure to become a favorite! This easy recipe uses a flax egg technique by whisking ground flax seeds with water to a gel-like consistency and combined with freshly cooked quinoa, which is somewhat sticky and dairy-free mozzarella cheese binds these toothsome bites. The Dill Dipping Sauce has a sumptuous creaminess built on dairy-free yogurt and nutritional yeast. We used the versatile Marukan Genuine Brewed Rice Vinegar in the quinoa bites to enhance the flavor of diverse ingredients and in the dressing for balance and depth of flavor. The delicate acidity and tangy, tart notes of this vinegar heightens the flavor of many dishes.